How is a dynamic load defined? In Advance Design, a load with time variation intensity can be modeled. 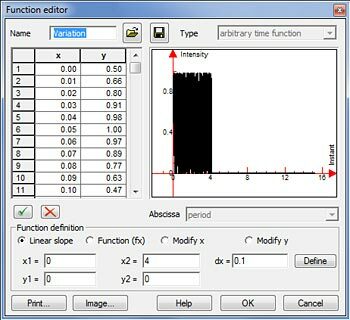 The variation can be harmonic, periodic or arbitrary; they can be defined directly in Advance Design using "Function editor" in the load properties window or using imported values. In the current example a machine weighing 3000kg is bolted on two parallel, simply supported steel beams. The span of the beams is 5.00m. The motor inside the unit generates a vertical load of 2.00kN with a sinus variation for 4.00 seconds and after that it is left to vibrate freely for another 11.00 seconds. The system's damping is assumed to be 4%. After the modeling of the structural system (beams, supports and masses) we can define the loads, self weight and dynamic temporal loads. First we must define the mass source, number of vibration modes and damping of the structural system in the modes properties window. Next we create the loads acting at the points where the machine is bolted and modify the temporal loads characteristics. 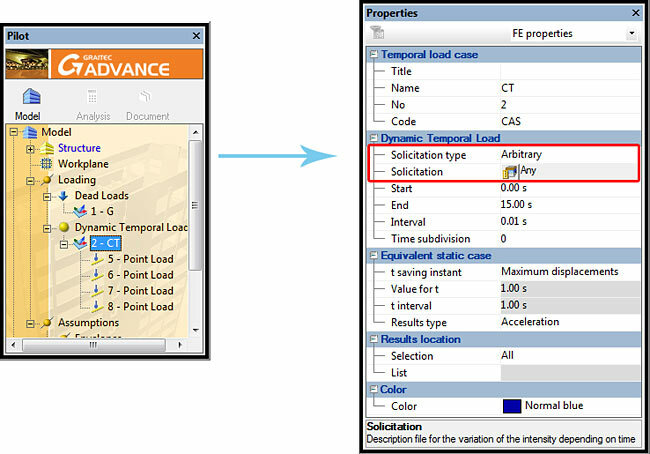 Select "Arbitrary" for "Solicitation type" and click the properties button in the "Solicitation" field to define the load variation. For the current example a manually defined variation will be used. In the "Function editor" window click the open file button. Add a name for the solicitation, verify the inputted data and click "OK". Back in the dynamic temporal loads properties window, the fields for Start, End and Interval are automatically filled using the values defined in the "Function editor". If you wish to refine the results, "Time subdivision" can be defined which will divide the already defined Interval. NOTE: If time subdivision is defined and the model is very complex, the analysis will take considerably more time to run. You can select how the results will be computed under "Equivalent static case" in the dynamic loads properties window. Regular range: results can be computed for time interval instants. In "Results type" you can select the results to obtain. 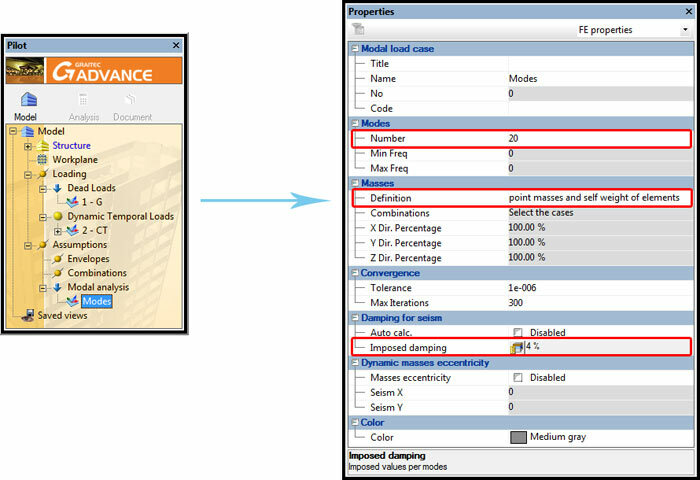 These options are included strictly for the time it takes the analysis to run; for example, selecting "Acceleration" will compute also "Displacements" and "Velocity" but will take a longer time to run than just computing displacements or velocity. In "Results location" you can define the geometrical points at which the program will calculate the results - "List" or calculate for all the points - "All".